Our guided town walks take in Windsor and also Eton if your group has more time. 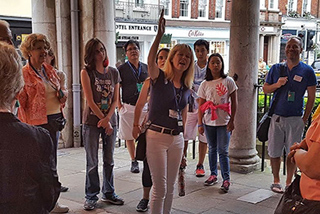 Windsor guided walks can be a morning tour, an afternoon tour or an evening guided tour. We will meet your group at the coach park, your hotel if staying in the town or at a point of your choice. In the Town Centre, back at the coach park or at a venue of your choice. 1-4 hours, according to your itinerary, and either morning, afternoon or evening tour. If you have more than 25 people we recommend more than one guide so that everyone can see and hear. The guided tour will be tailored exactly to you and your group's interests. For a guided tour of Windsor Castle please click here. Once again on behalf of our whole group I just wanted to thank you heartily for such a fantastic tour which you provided to us last week.